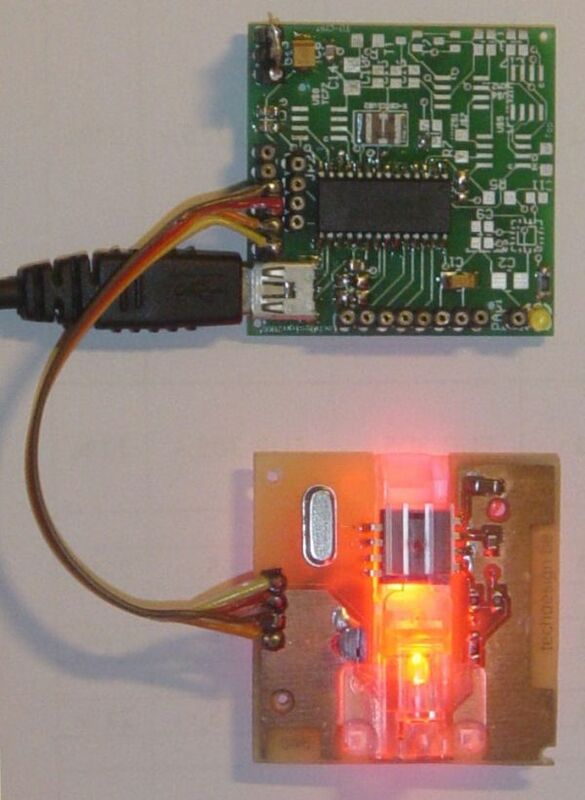 This is an example USB project showing how to interface an optical mouse sensor (the ADNS-2620) with a standard XP/Vista computer. the PC: USB 2.0 through a mini-B connector. the mouse sensor board: SPI over 4-wire flatcable. PC Win XP/Vista interface application with Visual C# 2008 Express: free download. TD-USB-01 (green pcb on top) with PIC18F2550 USB HID setup. Mouse sensor board (046) with ADNS-2620. USB Bus powered, no external power supply needed. ADNS-2620 registers selection stored in the windows registry. Refresh rate from 1mS up. Data bits & bytes details. Sensor CCD 324 pixels: image displayed: 18×18, 6-bit greyscale. TD-USB-01 software is 100% upgradable with a simple RS232 bootloader. RS232 interface for raw data readings. These assembled boards are available from our online shop. Source code (CCS C and Visual C#) can be purchased separately. Sensor example Source code (CCS C) , sensor board pcb layout and schematics (Eagle) available. Last update: March 28, 2009. Sensor Board (046): Eagle PCB layout: 046_v002.brd – Jan. 31, 2009. Sensor Board (046): Eagle Schematics: 046_v002.sch – Jan. 31, 2009. ADNS-2620: CCS c source code: optical_mouse_v03.c – March 27, 2009. TD-USB-01:Hex file: 046_v003.hex bootloading for the PIC18f2550 – March 27, 2009. Windows interface application setup: 046_app_setup.zip – March 27, 2009. Written in Visual C# 2008 Express, compatible with Windows XP and Vista.